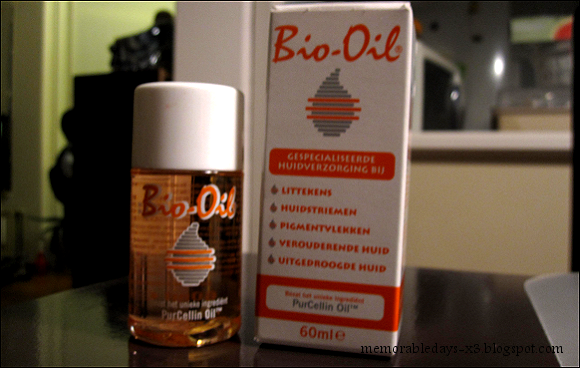 Bio-oil review | Memorable Days : Beauty Blog - Korean Beauty, European, American Product Reviews. Flashback; back in May 2010 - http://memorabledays-x3.blogspot.com/2010/05/bio-oil.html Click on the link to see what Bio-oil is. Description | Bio-Oil® is a specialist skincare product that helps improve the appearance of scars, stretch marks and uneven skin tone. Its advanced formulation, which contains the breakthrough ingredient PurCellin Oil™, also makes it highly effective for numerous other skin concerns, including aging skin and dehydrated skin. Apply it twice a day. Put some bio oil on your scar and massage that spot with your fingertips till your face has absorbed the oil. You can also use it on your body. I'm using it once a day instead of twice. I usually apply the bio-oil on my face before I go to sleep. I don't like to apply this in the morning because its too oily and your face will look shiny. Note. This is my personal experience with this product, it might work different on your skin. ♥ Didn't lighten my scars at all !!! I saw so many commercials about this product which made me curious to buy it. Too bad it didn't work for me, so I won't purchase this product again. reallyyy didn´t work on me :( boehoe!!! All those commercials on tv and awards that this product has won made me so curious xD so misleading! I tried it too, but it didn't work at all.